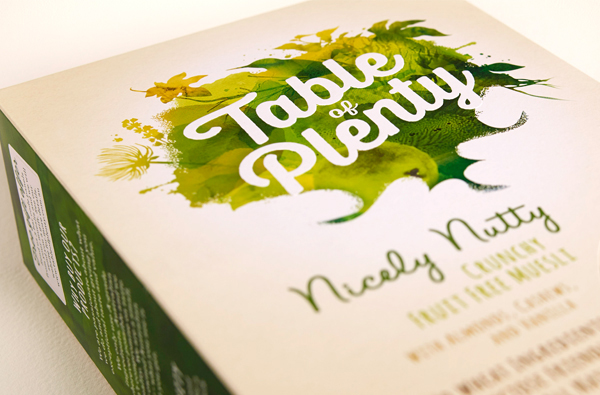 For a brand with emotional aspirations, Table of Plenty’s old packaging was extremely rational with the brand sitting on the front face in a corporate fashion, quite separate from the main graphics of the pack. 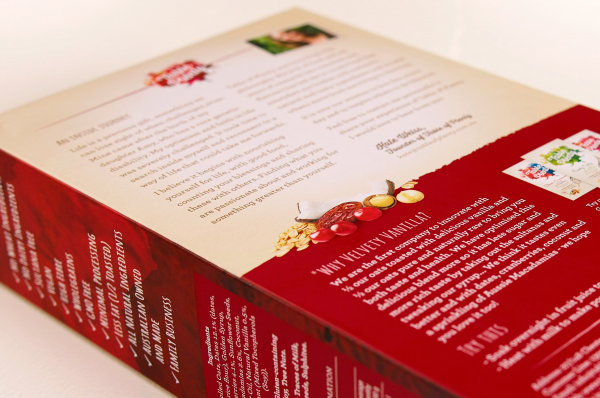 The new packaging had to better reflect their values, to look more innovative, creative and caring. In the design solution, a ‘burst of abundance’ forms a holding shape for the logo. This beautiful merging of watercolours and textures changes colour and density across flavour variants. Around the edge, leaves, birds and plants form a complex and stunning outline which evokes nature and celebration of life, whilst the negative space below the burst creates a ‘subliminal’ pair of cupped hands, underscoring the idea of nature’s bounty, and something that customers can discover over time as they form a deeper connection with the brand and the pack sits on breakfast table after breakfast table. The brand name has gone from being a corporate-looking heading to a stunning device that is central to the pack creative, to create strong brand recognition. Overall, the pack stands out by creating a moment of quiet and beauty amongst the loudness of the supermarket cereal aisle. 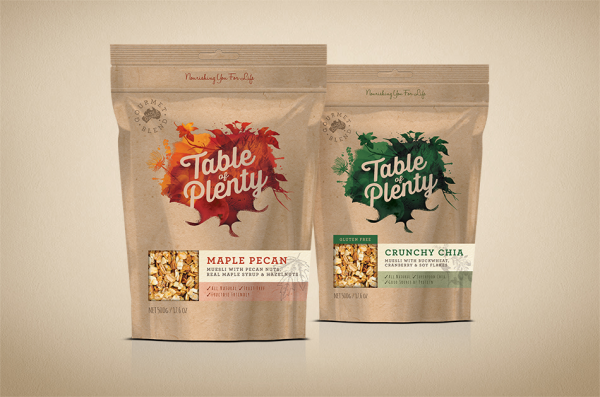 Table of Plenty creates Premium mueslis made from high quality ingredients. Its products are Natural, tasty, nutritious and good for you and your family. 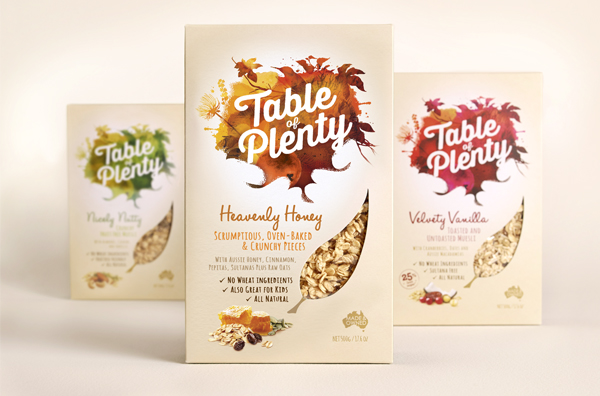 For a brand with emotional aspirations, Table of Plenty’s old packaging was extremely rational with the brand sitting on the front face in a corporate fashion, quite separate from the main graphics of the pack. 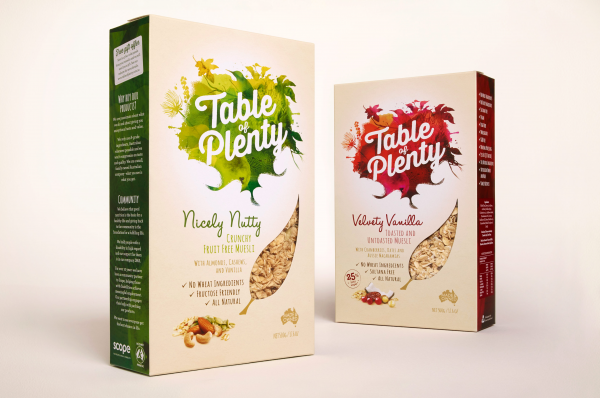 Table of Plenty ‘s new packaging had to better reflect its values, to look more innovative, creative and caring. There was a need to increase brand standout and add flavour cues. Rather than shouting the loudest with use of bold graphics and colours, Table of Plenty and their design agency were aligned in their desire to create something that stood-out through its pure aesthetic appeal and made a deeper emotional connection with its consumer. ‘Celebrate Abundance’ was identified as a territory to explore for the brand, as the company exists in order to make the lives of mothers and families easier, healthier and more abundant; to help them get the best out of life. The leaf window shape pulls some equity from the previous pack onto this new, much changed design. Photography of the ingredients give taste cues and the selection of hand-written fonts and parchment paper background give a nod towards the creativity of the founding entrepreneurs. Working with entrepreneurs who are very close to the brand that they have loving crafted since its infancy sometimes creates challenges. They understandably want to be part of the process and to sense-check every decision and move. 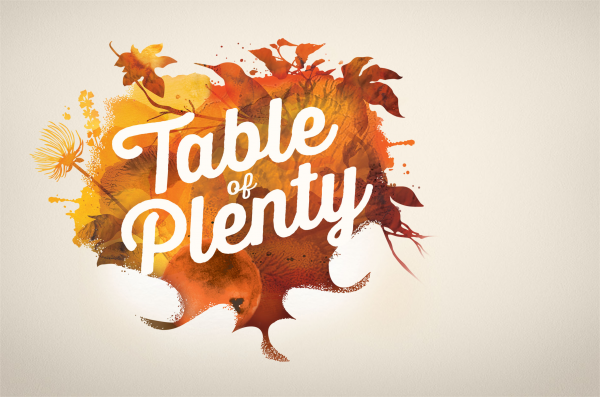 Boxer & Co. specialise in working with entrepreneurs, so we were able to involve the owners of Table of Plenty in the development of their brand and utilise their industry experience whilst leveraging our design expertise. The product is just filtering into stores now, but initial sales reports from both Coles and Woolworths are indicating a rise in sales of the newly packaged product versus the old design. 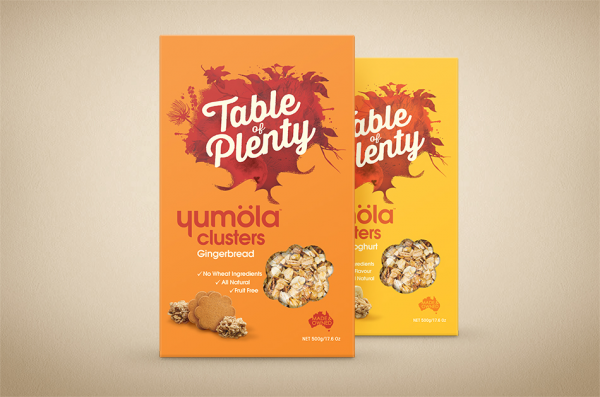 The supermarkets are so pleased with the new design that subsequent products - 'Yumola', a Eurpoean style muesli and a new, luxury product have been procured from Table of Plenty to add to their core range.